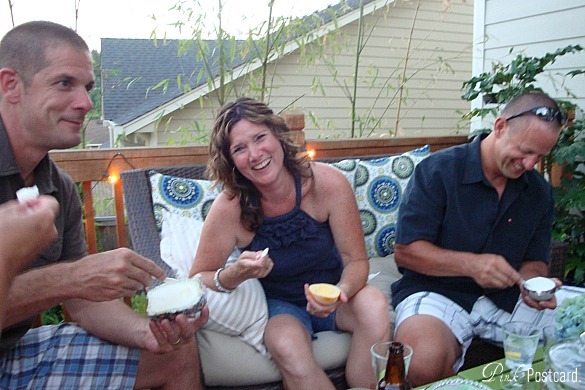 One of our favorite traditions during the summer is Frogmore Stew. This was the third year for our get together with our friends that we affectionately call "Group". Short for "Group Therapy". It's a long story, some day I may share the history there. 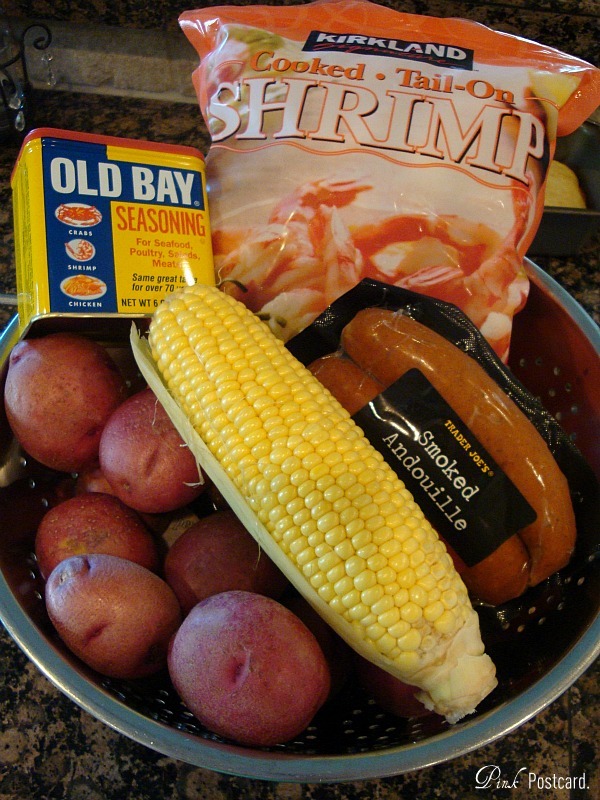 Frogmore Stew was a new recipe to me a few years ago. It's a recipe more familiar to the South. When I tell people from around here that I'm making this dish, they usually cringe a little and I have to assure them there are no frogs in this. It is a really simple, fun, and delicious meal. Everyone can grab and eat what they like. Bring water and Old Bay Seasoning to a boil. Add the potatoes and cook for 15 minutes. Next, add in the cut sausage and cook for an additional 5 minutes. Add the corn to the mix and cook for another 5 minutes. Last, add in the shrimp and cook for approximately 5 minutes, or until no longer pink (if using uncooked shrimp). While this is cooking, make sure you have some munchies for the guests. I went with some easy to prepare appetizers. The big hit of the night was the Trader Joe's pastry puffs with caramelized onions. They were gone so fast, I didn't even have time to take photos!! These yummy bites were crispy and flaky, cream cheese centers topped with tangy caramelized onions. I need to go stock up on these and keep them in the freezer for future parties! A simple veggie platter with some herb dip was also out with the pastry puffs. 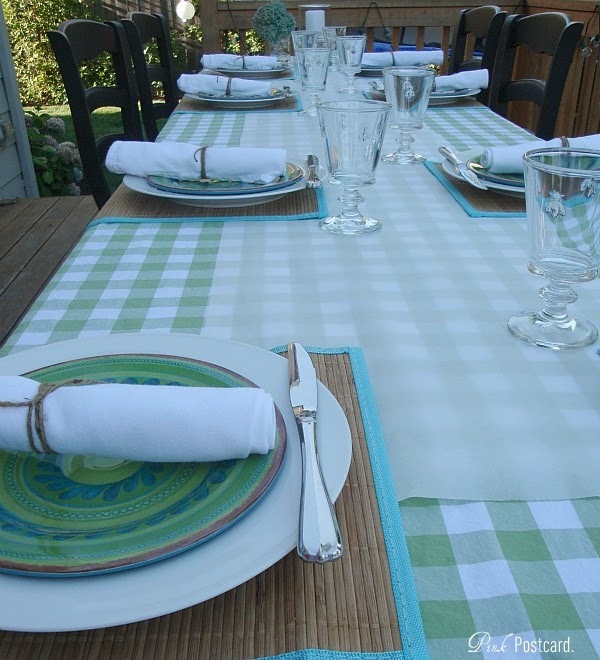 I made more of an effort this year to color coordinate the table to our outdoor furniture. 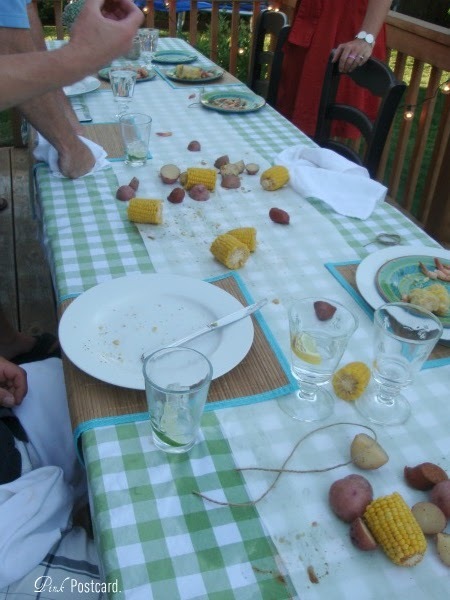 Traditionally you see Frogmore Stew laid out on a red and white checkered tablecloth. 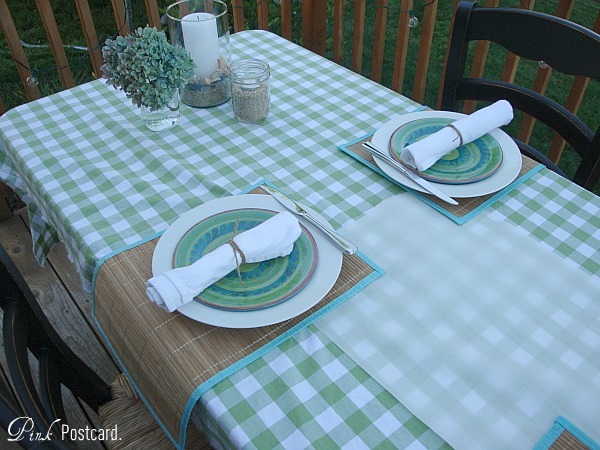 I went with green to go with all the blues and greens on our deck. 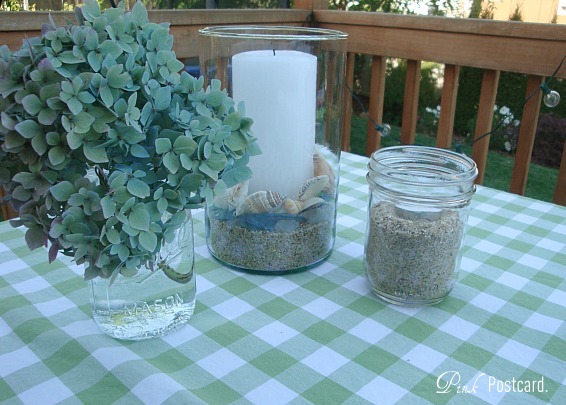 Some Mason jar votives and hydrangeas. The larger hurricanes are filled with sea glass, shells and sand. Isn't it amazing to see how the blooms have already changed from inky periwinkles, to faded pinks, greens and blues? 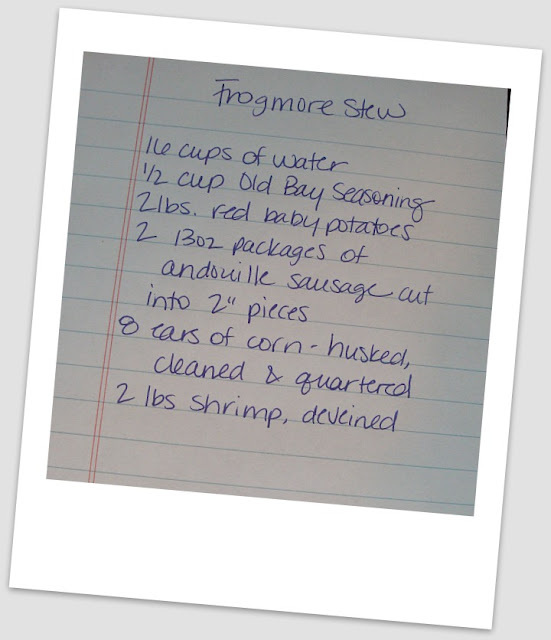 With Frogmore Stew, you lay it all out on the table so everyone can grab what they want, so I just put out a length of parchment paper for the food. Almost as soon as the food was out, the yellow jackets descended on us like a plague of locusts! We all made the best of it, and had a great time anyway. Sliced cornbread and butter was the only other addition to dinner. For dessert we followed up with some Island Way Sorbets. Really pretty in the fruit rinds, and yummy for summer. Pineapple, coconut, mango passion, and lemon pomegranate. A refreshing way to follow up dinner. Later on, the lanterns and candles all were lit up and we had a great time laughing, updating each other on what's going on in, and talking about what's ahead in our lives. This is a tradition we all cherish. I love it because it's fun, and great food- but it's also something that is a marker in each of our summers. Thanks for letting me give you a peek into our friendships and traditions. I hope this inspires you to call up your buddies and make some fun summer memories of your own! How fun, Denise! 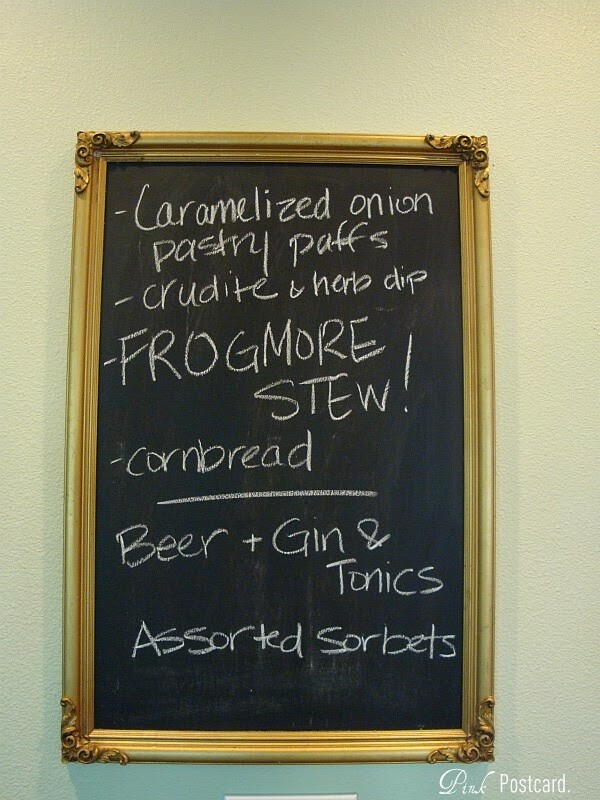 Sounds like a great night with friends and I love how the food is served! 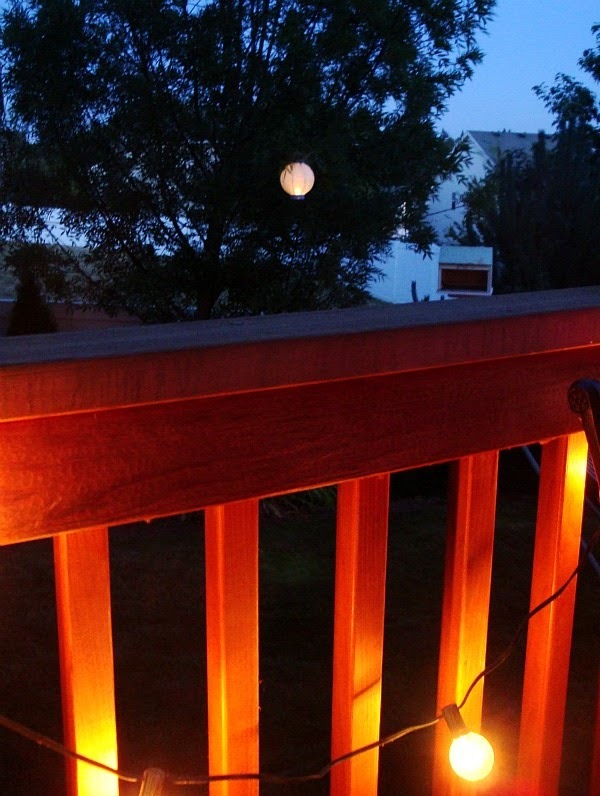 Great for a casual night on the deck! 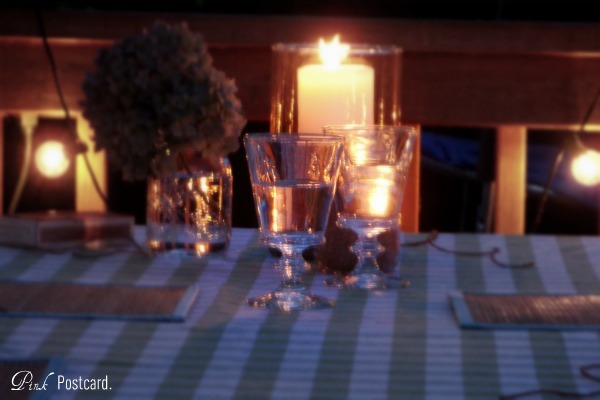 Your table decor looks so pretty too. This looks like such a fun get together! Yellow jackets...oh, no. Hope no one was stung. I hate those things! 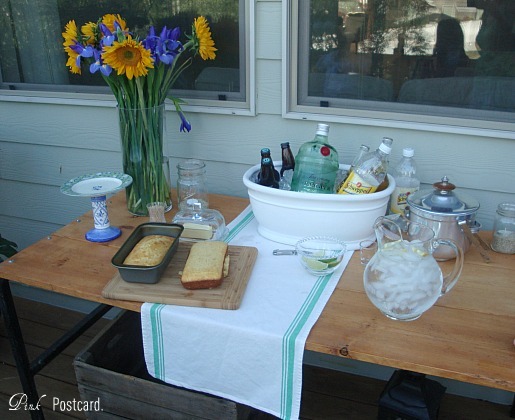 Can't wait for cooler days around here so we can enjoy the outdoors. Looks delish, beautiful and like you have an excellent "group"
I had to stop by to say hi after seeing this post! I started making Frogmore Stew after my college roommate's dad made it for us one summer at the beach! I've started calling it Lowcountry Boil and make it every summer when we go to the beach. In fact, we were just there a couple weeks ago and I made it! Just had a little feeling of nostalgia when I read Frogmore Stew! Good times and good food!